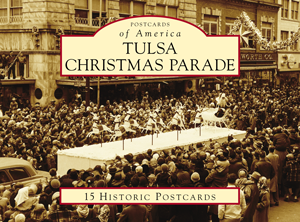 Tulsa, Oklahoma boasts a rich history of Christmas parades dating back to 1926. In this collection of fifteen vintage-photograph postcards, Jessica R. Gullo explores the history and tradition of these parades. Jessica Gullo has served as creative director for Tulsa Christmas Parade since 2015 and enjoys researching and preserving history for others to enjoy. Sen. Jim Inhofe (R-OK) served as the mayor of Tulsa from 1978 to 1984 and was a member of the US House of Representatives from Oklahoma's First District from 1987 to 1994. Since 1994, he has represented Oklahoma in the US Senate. For almost 40 years, Inhofe has been a fixture of the parade, riding his horse and greeting parade goer.